Makaya McCraven is a jazz drummer who is not afraid of playing in the moment and then going back, chopping editing and creating a new flow. He has been doing this since his 2015 debut and now his most confident and best release is presented on Universal Beings. The Chicago based McCraven, literal spanned the globe as he constructed this record from four pop up sessions (with the help of International Recording Company) based in London, NYC, Los Angeles and his home base of Chicago. Each live recording had a completely different band around Makaya as different themes and modes were explored. The most Impressive thing about Universal Beings may just be it's overall feel as a cohesive offering, which could have moved in four very different directions. First up is NYC (of course) with Brandee Younger (harp) Joel Ross (vibraphone) Tomeka Reid (cello) Dezron Douglas (double bass) McCraven (drums) and this session proves to be the most fruitful of them all. The recording took place on April 29th in Ridgewood and moves from gloriously beautiful (Younger's harp on "Holy Lands" and Ross' vibes during "Young Genius") to ominous (Douglas' bass on "Black Lion") around the strings and pulsing rhythms laid down by McCraven; his closing run on "Black Lion" in particular is a whirlwind, but his nuanced beat pushes the rolling "Mantra" in restrained fashion as well. Next up is Chicago as McCraven is joined in his hometown by Shabaka Hutchings (tenor saxophone) Tomeka Reid (cello) and Junius Paul (double bass). This set gets trance laden and hypnotic with it's centerpiece "Atlantic Black" which uses loops and doubling of cello and sax to disorientate around the ever pulsing rise of the beat. While the ten minute outing might not be for everyone the session "Inner Flight" pulls back in the cool groove. Jumping across the pond the musicinas in London, Nubya Garcia (tenor saxophone) Ashley Henry (Rhodes piano) Daniel Casimir (double bass) join in the fun as McCraven leads them around skittering beats and procedures. The session is more trance orientated with the repitition of "Voila" setting the stage, while "Suite Haus" continues that thought but in a more post-bop fashion. The lounge based "Newbies Lift Off" is the most satisfying of the England excursions, but this stop is the least affecting on the world tour and dulls in the middle of the record. The album wraps up with Los Anglese as Josh Johnson (alto saxophone) Miguel Atwood-Ferguson (violin) Jeff Parker (guitar) Anna Butterss (double bass) Carlos Niño (percussion) all contribute to the wide ranging session. The chaos of "The Count Off" gets jarringly shifted to the mellow trip hop beats of "Butterss's" before the smooth jazz of "The Fifth Monk" but it is the album closing title track which highlights the west coast portion of the album with it's groove and fluttering horns, lush bass and odd squawks. It is a fitting way to wrap up an overall successful record. There is post bop, hip hop, avant garde and free/cool jazz, all blending around an impressive collection of moving excursions. 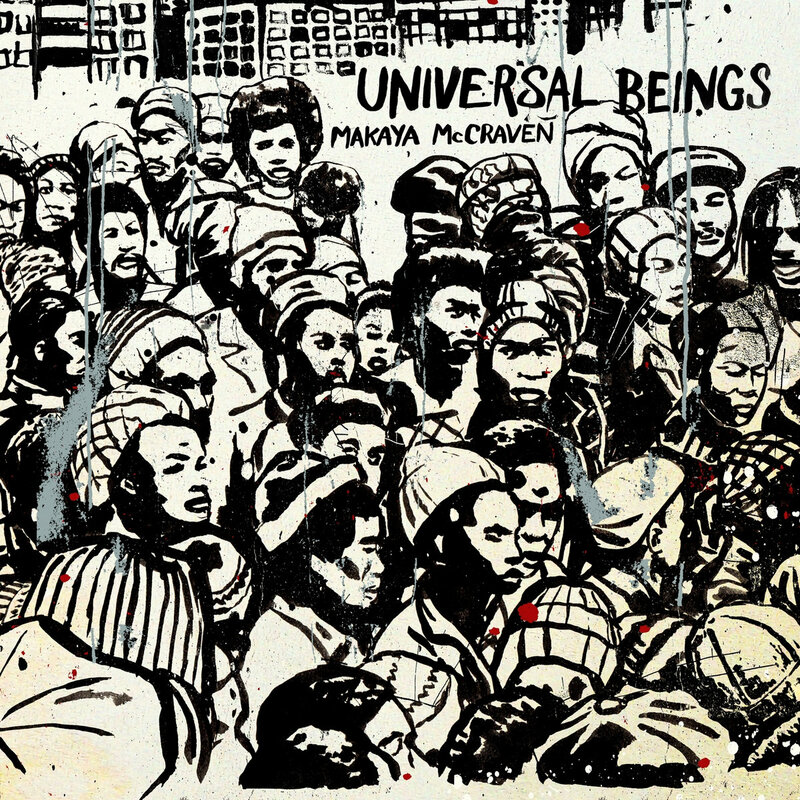 Universal Beings is a testament to McCraven's ear for organic beat music and his teammates for adding to the blissful ride.